At the end of a fight, your Dinoz may have lost some health points. In order to avoid death, you must heal your Dinoz. 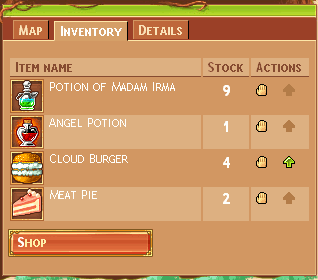 To do this, you can buy various items which will heal your Dinoz in the Shop. To see the list of item you possess, or use them, click on the Inventory tab on your the Dinoz's page. For example a Cloud Burger restores 10 health points to your Dinoz. If your Dinoz has very few health points, he can Rest. Resting enables him to recover health points over time; however, he cannot make perform any other action while he is resting. Initially, your Dinoz recovers 1 1 per hour, but it is possible to improve the rate of recovery using special skills. You can stop resting at any time, but your Dinoz can't recover more than half of his health points by resting.